Black Star Riders have announced a UK and Ireland tour for March 2017 with Backyard Babies, Gun and the Amorettes, to follow the release of third album Heavy Fire. 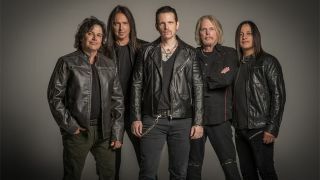 Frontman Ricky Warwick says: “It seems like ages since we did the Def Leppard and Whitesnake tour, so we’re all really looking forward to be back out on the road. The band have released an announcement video, available below. Tour tickets go on general sale at 10am on September 16.